You’ll be reaching for this wardrobe staple time and time again. 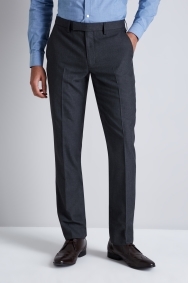 Textured grey, this pair of trousers by Moss London goes with almost any shirt and tie combo, and will look the part at any business setting. Designed to flatter a lean, masculine shape, they slightly taper down the leg and clip the top of the shoe. 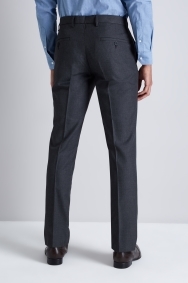 Match the streamline shape of the trouser with a slim fit shirt and skinny tie in any colour you choose. Your shoes will be on show so make the most of the opportunity to show off your personality with a monk shoe or loafer, and make sure they’re freshly polished. Nice trousers at good price. Labelled as SLIM, these are actually SKINNY. Be warned, don't buy if you want a SLIM fit!! They look great, fit well and seem very well made. The wrong items were sent to me. These haven’t broken so far. Great fit, quality and customer service. Good quality. Good price. Slightly tighter around the thighs but seem to be okay still. Happy with them. Fabulous trousers. The style is exactly what my son wanted. The price was fantastic and the garment is washable. Fabric is very soft yet it retains a crisp appearance. The fit was so good, they could have been tailored for my son, despite being off the peg. Doesn't appear like the image in person.